The meeting of Newsxchange international forum opened in Istanbul November 2. Responsible for Haylur information program of the Public TV Company of Armenia Harut Harutyunyan and Information Department Head of Yerkir-Media TV channel, MP, ARF Dashnaktsutyun member Gegham Manukyan took part in it. Turkish PM Erdogan addressing the meeting reaffirmed Turkish official stand that there was no Genocide. In response to Erdogan’s statement that owing to the war Armenians of border regions of the Ottoman Empire were merely deported, Gegham Manukyan asked a question how it could happen that Ottoman MP Grigor Zohrap was arrested and killed. He also stated that Istanbul is a city, symbolizing the beginning of the Armenian Genocide by arrests of Armenian intelligentsia on April 24, 1915. Gegham Manukyan urged the Turkish society and especially journalists to study these dark pages of their history and recognize the fact of the Armenian Genocide. During his speech he raised a poster, on which it was written in English, «Turkey should find courage to recognize the Armenian Genocide.» Then Gegham Manukyan was surrounded by policemen, who wanted to take him out of the hall. However, journalists prevented this by asking Manukyan for a news conference. Manukyan repeated his urge in English and Turkish. The organizers of the session stated that if Manukyan is arrested, they will join him, reports the Yerkir. The “Grigor Zohrap” carpet of historical importance, the first and most anticipated exhibit of the carpet museum, was solemnly opened at the National Center of the Armenian Carpet on 27 December. Grigor Zohrap (1861-1915) was an outstanding writer and publicist, one of the most prominent lawyers of the time, a public and political figure, a member of the Ottoman parliament, Armenian Genocide victim. Living and working in the Ottoman Empire, the western Armenian writer enjoyed a reputation among both Armenian and Turkish population. As a member of the Ottoman parliament he actively participated in parliamentary debates, touched upon the most challenging issues and demanded solutions for them. Although Grigor Zohrap enjoyed the close friendship and affection of the Ottoman Empire political elite, he did not escape the fate of his people. “Grogor Zohrap” carpet is a symbolic achievement for the Armenian carpet museum. It summarizes a whole period of the Armenian people’s history with endless struggle, great losses and the ability to survive. The Armenian Highland is one of the oldest carpet weaving centers, and although how much Armenian carpets are different in their colors, ornaments, symbols, motives, they still stand out in the original manuscripts. Portrait carpets are of a great interest in this diversity. The carpet with the portrait of Grigor Zohrap is a unique example of portrait carpets, which, according to the experts, was woven by the Bedoukian family before 1909 in Sebastia (Sebastia province, Ottoman Empire). The carpet was lost during the Armenian Genocide, then was found in the collection of Jack Kadry, a collectioner of oriental carpets. In the spring of 2017 the carpet appeared in the Autralian auction by “Mossgreen” company. The carpet was of particular interest at the auction, which indicated the number and geography of the buyers. 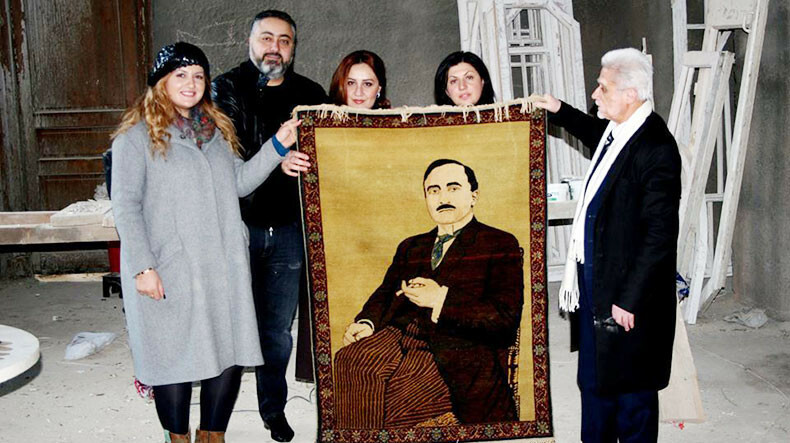 Victor Mnatsakanian, the founder of the Armenian National Carpet Center, succeeded in buying the carpet and donating it to the Armenian Carpet Museum. The carpet, no doubt, will be included in the permanent exhibition of the Armenian Carpet Museum. The National Center of the Armenian Carpet will refer to the history of Armenian carpet weaving in Sebastia in its future publications. Those carpets are the choicest and the most beautiful ones in the world according to the famous traveler Marco Polo.